With NUBO, aesthetic astonishment is provided by the unexpected meeting of the ‘déjà vu’ and a surprising new element: the simple space-saving wall shelf metamorphoses into a treasure box, evocative of a suitcase such as the Air France blue fabric travelling case of the 1960s. Its rounded cloud shape and luminous yet warm association of natural oak and sky blue wool fabric also fall into the same vintage Scandinavian register. 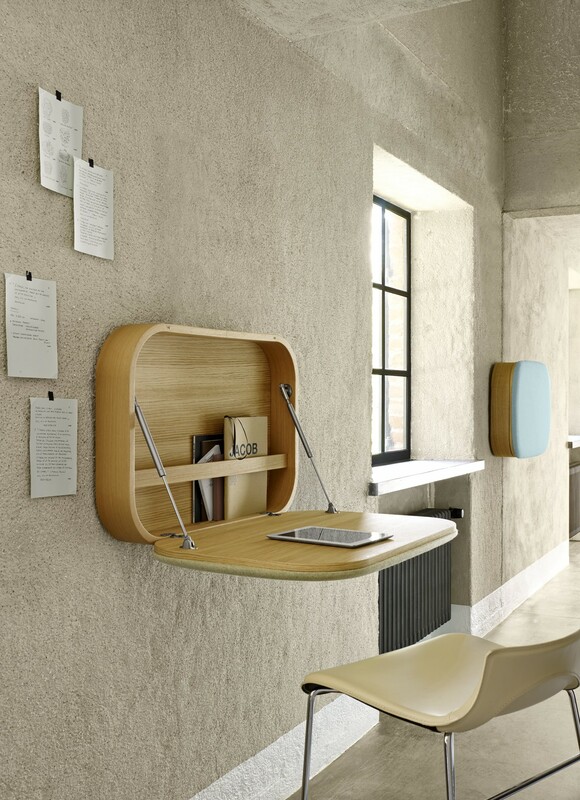 Both an occasional desk and a decorative wall-mounted element of compact dimensions (depth 14 cm), NUBO offers, when open, a functional work surface equipped with a cable slit and a retaining bar for documents.